Are you traveling to Japan for the first time? Congratulations! Now, allow me to prevent you from overpacking your suitcase by telling you a little bit about my first visit to Japan, back in the spring of 2012. I was panicking a bit about my visit, so I overpacked! Being from a tropical country, I thought Japan would be extremely cold in the spring, so I packed all of the warm clothes I owned for my 7-day stay in Japan. I packed so much clothing that not only did it become a nightmare to take on the trains (I didn’t know the magic of TA-Q-BIN yet), but I also ended up neglecting the things that really mattered. 2. Pack light. Whether your backpacking in Japan or on a family vacation, it’s critical that you pack light. This is because in Japan, as soon as you get out of the airport, you’re going to use trains (and sometimes buses) a lot to get around. Many subway stations don’t have elevators and escalators, so stairs are the only options. Taking heavy bags which are near the maximum allowable weight that your airline permits will just slow you down and add a lot of frustration. Bring what you only need. Another thing to consider when packing is WHERE and WHEN you’ll be going, since the items needed may vary between different cities. More importantly, if you follow our essential clothing guideline, you’re going to thank yourself. We don’t want you regretting that you didn’t bring ‘this’ or ‘that’ for your Japan trip. No time to read our comprehensive Japan packing list now? No worries. We can send you a simple checklist in .PDF copy so you can print it anytime and use it as your guide while packing for your Japan trip. Yes! I want a .PDF copy! »Takes 5 seconds to download. 1. Valid passport and visa. 3. Driving license or International Drivers Permit. 5. Credit cards or debit cards. 7. Comfortable slip-on shoes or boots. 8. A sturdy travel backpack. 9. A foldable and packable travel bag for souvenirs. 14. Mobile phones, laptops, tablets. 16. Chargers or spare batteries. 19. Kindle E-reader or Japan Guidebook. 20. A carry-on handbag or backpack. As obvious as it might sound, it’s not uncommon to hear that someone’s passport expired right before their planned trip. To add to that, some people assume they don’t need a visa when they in fact do. Before you buy a ticket, check your passport if it’s valid for at least 6-months and with a blank page. You should also check if your nationality requires a visa. If you made any reservations for hotels, tours, pocket wifi, JR pass voucher, etc., don’t forget to print them out or save them on your phone before you get here. JR Pass or Suica prepaid card. MONEY SAVING TIP: If you’re traveling to Japan without a JR Pass, you can save time and money by booking your airport transfers before your arrival. For the list of all airport transfers in Japan, see: HERE or HERE. Make sure to find the most appropriate airport transfer for you. If you plan on renting a car or Go-Karting, then you need an unexpired drivers license, or international drivers permit. GO-KARTING is one of the most thrilling experiences you can have during your stay in Japan! Most visitors never miss out on the opportunity, so don’t forget to put that driver’s licenses in your wallet. Sightsee & Sushi recommends RoamRight and World Nomads travel insurance for Japan travel. Although Japan is one of the safest countries in the world and it is very unlikely that you will run into any danger, it doesn’t hurt to be on the safe side. With insurance, you don’t have to worry about paying extra fees for missing baggage, canceled flights, or unexpected medical emergencies. My friends have used World Nomads because it’s affordable and provide good medical coverage. RoamRight is great for U.S. and Canada citizens. And if you’re an Australian, World Nomad is a better option for you. Make sure to visit both websites to compare quotes. Japan is still primarily a cash-based society despite how technologically advanced the country is. However, you will still need a bank card to withdraw cash from ATMs in convenience stores such as Lawson, 7-11 and Family Mart. Visa and Mastercard are the most common type of cards widely accepted in Japan. REMINDER: To avoid any sudden card declines, contact your bank before leaving and inform them about your travel dates. MONEY TIP: It is best to withdraw Japanese Yen upon arriving at the airport. The exchange rate is much better than getting the Japanese Yen from your home country. There are many ATMs inside the airport, and we recommend that you withdraw cash before leaving the airport. You can also get the ever rare ¥2,000 bill from airport ATMs, which is similar to how rare a $2 is in America, and just as frowned upon when used! The type of clothing to bring depends on the season and/or your destination in Japan. We’ll soon have a dedicated article about what’s the best clothing to pack for Japan, from base layers to outwear. In general, a neckline that is too low should be avoided for women. Men can wear shorts, but you won’t see many Japanese men wear shorts. Check out our dedicated packing list for each season in Japan. The average temperature in Japan during spring is between 5-21 degree Celsius (41-70 degree Fahrenheit). Spring in Japan can get pretty chilly at night and in the morning, so we recommend that you bring a base layer or two. 1-2 pcs lightweight or midweight merino baselayers. 2-3 pcs sweaters or pullovers. 1 pc spring coat or spring jacket (see sample spring coat for men and women). 1 pc travel pants or jeans. Underwear and bra for women. The average temperature in Japan during summer is between 18-29 degree Celsius (64-84 degree Fahrenheit). One thing to remember when traveling Japan during summers is that it’s an incredibly humid season and it also rains a lot due to being typhoon season. Flights will often be canceled or delayed, and some amusement parks will also close if they’re very much affected by the weather. Personally, I avoid traveling around Japan during the summer because of this. 1 pc sweater jacket or cardigan. The average temperature in Japan during autumn is between 9-26 degree Celsius (48-79 degree Fahrenheit). We’re bias but autumn is our favorite time of the year and in our opinion, the best time to travel Japan — not too dry, not too cold, and less rain. 1 pc fall coat or jacket (see sample fall coat for men and women). The average temperature in Japan during winter is between 2-11 degree Celsius (36-52 degree Fahrenheit). Despite being a dry season, winter is our second favorite season because of fewer rains and clearer skies. And we’re Mt. Fuji lovers so if you wish to see Mt. Fuji in its perfect state; unobstructed, then you are going to love traveling to Japan in the winter. 1-2 pcs heavyweight merino base layers. 1 pc insulated coat or jacket. HEALTH WARNING! Winter in Japan is extremely dry. Most hotels in Japan have humidifiers. However, if you’re staying at an Airbnb place, most don’t have it or will charge extra for it per day! We stayed at an Airbnb place one winter and it didn’t have a humidifier. We all woke up with painful throats and were tired because we didn’t get a good nights’ sleep due to dryness! So make sure to bring your own portable humidifier designed for travel. Although cheap humidifiers can be purchased once you arrive in Japan from electronic stores or other discount stores, the quality isn’t great and the resulting function is very minimal. So we recommend you buy one before arriving. Amazon offers a wide range, but we recommend travel humidifiers from Crane and Boneco as they are USA brand. Casual winter leather boot from Skechers. Featuring Goga Mat cushion. Suede is water repellant. We’ve already discussed this in another article as well. Any shoe with a good cushion like memory foam technology will do because they provide ultimate comfort for your feet. A lot of the time you will be required to take off your shoes at genkans (the entrance of a home), traditional restaurants, or temples. Shoes without shoelaces are convenient in these situations. During spring or summer, however, waterproof slip-on shoes will come in handy because it is guaranteed to rain a great deal during those seasons. For winter, make sure to get winter boots that don’t require lacing. Osprey Sojourn series functions as both rolling luggage and backpack. 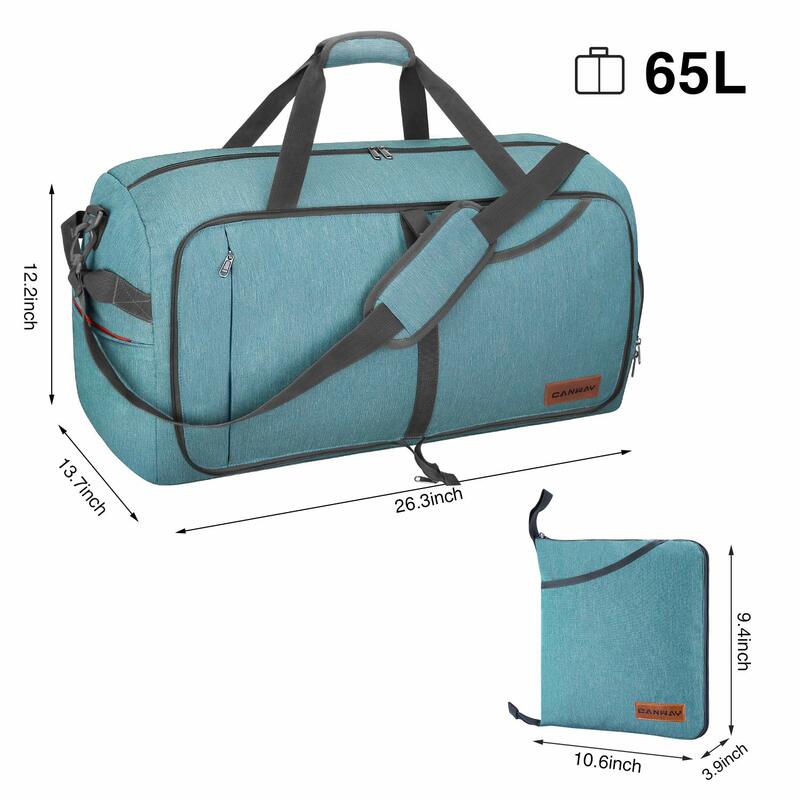 Available in 45L, 60L, and 80L. If you’re staying in Japan for a week, a city travel backpack will suffice. However, if you’re planning on staying for more than 2 weeks, it would still be best to use a backpack rather than a suitcase. This is because there are a lot of stairs in Japan, and it can be difficult to board buses or trains with a suitcase. The trains in Japan also have small storage spaces where a large suitcase just won’t fit. With backpacks, you can quickly grab anything you might need. If you don’t like backpacks or you’re carrying a lot of luggage, we recommend a wheeled suitcase that can be used as a backpack as well like Ospreys Sojourn series. Their sizes are perfect for Japanese public transportation. They’re relatively light and slimmer than most suitcases, and they also have a lot of space for all your items. We recommend Canway Foldable Duffel Bag. They’re sturdy, high-capacity, and made from well-constructed materials. Also available in 5 colors. If you plan on shopping in Japan, then you’ll end up needing extra storage space. This was a mistake my mother made when she first traveled to Japan. She didn’t have any extra bags so she had to buy one for all the souvenirs she bought. To avoid the extra cost of buying a piece of additional luggage while in Japan, make sure to pack an extra travel bag that is lightweight and foldable. Tuck it inside your main luggage bag! Here’s what packing cubes look like if you’ve never seen one. They’re from Bagail. PACKING PRO TIP: We love packing all our clothes in packing cubes! While it may seem like it’s just adding a step in the packing process, the organization they provide makes the extra step worth it. They keep your clothes compact and tidy which allows for either more stuff or less luggage! We never travel without them now, and they allow us keep our luggage down to two backpacks for weekend and holiday trips around Japan. We purchased our packing cubes from Amazon, but the brand we use is no longer being sold. For quality, go for eBags. However, if you’re looking for affordable packing cube set, BAGAIL brand is trusted by many travelers. For liquid, it is best to pack them into TSA-approved squeezable leak-proof silicone bottles. If you have a preferred choice of shampoo, conditioner, body wash, deodorant, etc., it is best to bring it along with you. It is not likely that you would find the same brand in Japan. It may also be difficult to find similar products since the ingredients would be written in Japanese. For ease of use, you can pack them into a squeezable leak-proof silicone travel container. It is also best to consider bringing a bar soap instead of liquid soap to save up some space. Most hotel rooms provide basic toiletries for you to use, but you and I both know that hotel shampoo and conditioner are generally low quality. Medicine such as Tylenol or jet lag relief pills can come in handy especially because the flight to Japan can be very long. You should confirm if the drug is legal in Japan before the trip. You can also buy common drugs from drug stores in Japan if you’re confident in your Japanese abilities. A towel is an indispensable item in Japan. In fact, we have covered the importance of a towel in a previous article, and you can read it here. We recommend a quick-drying microfiber towel similar to this as it’s lightweight, super-absorbent and very packable. If you’re staying at a hostel or will be using an onsen (Japanese public bath), it’s better to bring your own towel because they usually charge you extra for renting their towels. Checking the speed of my portable WiFi. A mobile phone, connected to the internet, is necessary to find train routes and schedules to navigate Japan. A tablet isn’t essential, but it can keep kids entertained during train rides and such. Using your home countries SIM data could rack up insane roaming fees. So its best to rent a portable pocket WiFi. You can pre-order it online and it will be ready for you at the airport or hotel when you arrive! Pre-ordering it online is also cheaper than walking-in at a WiFi rental shop at the airport. And don’t forget to install these must-have apps before you leave for Japan. Strolling around Mt. Fuji with my camera. Can you really say you’ve visited Japan without some evidence? Japan is a beautiful country, and a camera allows you to capture those rare moments that you can revisit anytime you want to. We use an older version of this Nikon DSLR, yet it still takes good pictures. Photography is actually a favorite hobby in Japan, particularly for the recently retired. So don’t be surprised when you see an elderly Japanese person lugging around large telescoping lenses and tripods; they are usually stock photographers shooting beautiful scenery as a hobby. It’s always a sight to see them carrying all that gear around! You might run into some trouble if your electronic gadgets, such as your phone, runs out of battery in the middle of nowhere. You also wouldn’t want to miss out on all the Instagram moments. Therefore, I don’t forget to carry a charger or spare battery with you when sightseeing in Japan. RavPower with 26800 mAh. Good for 4-5 full charges for iPhone and Android phones. A power bank will provide extra power to your devices when the battery runs down. Trust me, using the internet constantly will drain your battery quickly. Therefore, a power bank with a high mAh or a battery capacity that’s good for 2-3 full charges should be carried along with you at all times. Power banks in Japan are very pricey and with little battery capacity, so we suggest that you buy one from your home country. Amazon sells a wide range of power banks but we recommend the RAVPower brand because of its higher battery capacity or mAh. Japanese style plug sockets differ from most countries (two-prong plugs). Japan uses Type A and Type B plugs and sockets just like in the U.S. and Canada. In this case, get a universal power adapter preferably with Type A & B sockets. We recommend travel adapters from SublimeWare as it’s well-designed, compact, and made from well-constructed materials. Carrying books will only increase the weight of your luggage. A portable E-reader such as a Kindle would allow you to read your favorite books, that’s if you find the time too! You can also download our recommended Japan guidebooks. Hynes Eagle 38L carry-on bag. A side bag or carry-on handbag or backpack is necessary to put in things that you would often use in the airport and during your visit. It is essential that you DO NOT check-in your electronic devices in with your large luggage to avoid any damage during the long flight and to avoid losing your most important assets in case of lost or misrouted luggage. So we recommend getting a carry-on bag that is big enough for your electronics but still within the carry-on requirement of your airline. Amazon has a wide range of flight approved carry-on travel backpacks. But we recommend Hynes Eagle as it’s spacious, stylish, and made from durable materials. The journey is bound to be a long one, and you’re definitely going to want to sleep for most of the flight. Taking a packable travel pillow from AERIS brand will make this easier. To cancel out the noise of the airplane engines and your fellow passengers, you can get a pair of noise-canceling headphones. This way, your sleep can go uninterrupted. That’s it folks, the ultimate packing list for your trip to Nippon! Don’t be afraid to carry any extras you think you might need. Enjoy exploring the traditions of Japan.